The Helmet Lock by Little World is comprised of a Carabiner style D-lock (with PIN code) and a 1.8 M self coiling braided steel cable (3mm thick). You can attach one, or 2 helmets or even a helmet and a jacket at the same time to the bike. All parts are coated with a protective sleeve so that the chrome of your bike or your helmet won't get damaged. 1. Use the Cable to attach your helmet to motorbike. Very safe and easy. 2. 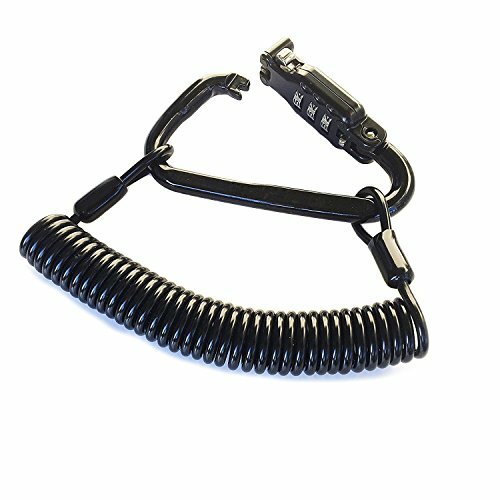 Using the D-lock only, loop the open D-lock through the helmet buckle and attach to your Motorcycle handlebar or mirror. Safe and very quick. - Comes in a high quality protective recyclable blister packaging.